We've gathered a list of unique ways great companies large and small across the globe show recognition and appreciation for their staff. Now that you have the tools you need to build a culture of appreciation, it's time get started. It's not always easy to come up with creative ways to recognize and reward your teammates for their great work, so we put together a list of unique examples from some of our favorite companies across the globe. Just like the people and contributions they're celebrating, these recognition techniques are unique. 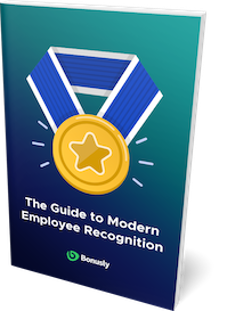 Most of these examples are not complete strategies in themselves -- they're part of a larger strategy incorporating the key elements of effective employee recognition: frequency, timeliness, specificity, and visibility. Being a semi-remote team, every year we gather somewhere in the world to network, celebrate our milestones, brainstorm ideas and just to unwind and have fun together. Thanks to the exceptional generosity of our co-founders, this year we were lucky to travel to Maldives for our annual retreat. Those values are an integral part of our Bonusly reward system where we give each other points that recognize someone's leadership skills, helpful attitude or teamwork, all accompanied by hashtags such as #helpful #leadership #thoughtful. Before the retreat we summed up all the highest scoring hashtags based on Bonusly points and during Hopeful Awards Ceremony, we gave out gifts. Winners received a special edition of t-shirts with the HOPEFUL acronym, unique certificates and hand-illustrated avatars like the above, illustrated by See Mei Chow and Mok Ee Lin. This is just one of the ways we give recognition to employees at Piktochart but we believe celebrating those good examples will inspire others to do the same. I've always valued how our CEO recognizes our team on work anniversaries and birthdays. He'll write a hand-written note thanking us for the hard work we put in each day and highlighting some of our recent achievements. Hand written notes are an extremely underutilized form of appreciation, but they'll never go out of style. Each Friday afternoon, our entire team comes together to recognize another team member's hard work during that week. We go around the room stating who we want to "Crush," and also one thing we're grateful for. I think this tradition has been especially important as our team has grown. When your company is only about 30 people, you usually know what everyone else in the company is working on. But once you start approaching 100 people, the overall interdepartmental interaction goes down a lot. So the "Crush It Call" has been an important way for people to learn about all the amazing work people from other departments are up to. If you want to see a quick video of one of our Crush It Calls, check out this post (under #15). We play hard when it comes to employee recognition. At the end of the year, we have four awards that we give out — rookie of the year, going the extra mile, spirit award, and MVP. These are all peer-nominated awards, and we even do video recordings of some of the nominations that we show at annual holiday party, where we announce the winners. But we know that you can't recognize employees only once a year. During our bi-weekly all-hands meeting, we do lunch drawings. One employee, who was previously selected for exemplifying our company values, draws a name out of a bowl and that pair gets to go out to lunch together on the company. At Typeform, we have a kind of internal play book with a list of values and guiding attributes we try and follow. It helps us maintain a humble, friendly, and ultimately more human environment. One of the things on the list is to "celebrate with spontaneous applause". It sounds a little cheesy and sales-y but it's actually a nice Typeform tradition. Whenever someone does something noteworthy—however big or small—anyone can start a round of applause. The whole office joins in. The beauty is that most people have no idea why they're applauding, but the person receiving the applause does. It's a nice, momentary break for celebration. Everyone wants recognition for their contributions to the company, but not everyone feels recognized in the same way. At Button, we have each new employee fill out an orientation survey on their first day. One of the questions we ask is, tell us about a time you felt appreciated for your work. This provides the management team with insight into how to make sure all Buttonians are able to be recognized in ways that they feel appreciated. “Nemonations” is our large format, company-wide recognition for going above and beyond expectations. Each Friday at demos, team members can “nemonate” their deserving colleagues who went the extra mile that week and we pass around a stuffed Nemo (of Disney’s Finding Nemo fame) to the recipients. For smaller, everyday props, we have a kudos system focused on our company values. Team members are encouraged to recognize their colleagues who exemplify the values in practice. Kudos are distributed in Slack and are also announced at Demos at the end of each week. Button is a collection of people who thoroughly enjoy a challenge. Competition is often our most successful motivator for voluntary tasks, like recruiting. To recognize Buttonians for helping to build our team, we have a quarterly competition known as The Ultimate Hiring Challenge. We have one winner each quarter and the prize is individually tailored to their passions -- be it a month’s supply of unlimited burritos or Hamilton-themed Soulcycle sessions, we make sure the winner feels appreciated for her contributions. Per [Small Improvements' Founder and CEO] once gave me an iPad with a new title engraved on the back which was his recognition and action of promoting me ;) That was very cool. At Bonusly, we use peer-to-peer microbonuses to celebrate success and show appreciation for our teammates' contributions all throughout the day. Each time someone is recognized by a colleague for doing something valuable, the whole team is notified, and is given a chance to join in on the celebration. We have offices in New York, NY and Boulder, CO. To make sure we're always aware of the great work everyone is doing despite the distance that separates us, we project a dashboard displaying all the recognition going on throughout the day. It's impossible to miss, and there's something special about seeing your achievements posted in a larger-than-life format. We love Slack. It's our go-to communication and collaboration tool for nearly everything, and we frequently use it to give recognition. Every time someone receives a microbonus, the entire company sees it pop up in our #general channel. Since we all practically live in Slack, it's a highly-visible way for everyone to see all the great work that happens on a daily basis, no matter which location they're working from. Although we're huge proponents of timely recognition, there are some great ways to take a snapshot of those moments of praise, and remember them. In our Colorado office, we printed word clouds from all the microbonuses given out by members of our team, framed them, and hung them all across the office. They've been a great reminder of our organizational values, and a fun way to maximize the benefits of the recognition we're giving out daily. Anyone new to the team gains an immediate sense of what we value, and veterans get a chance to look back and share past achievements. You may have noticed a theme developing across these examples: they're highly visible, frequently given, they're genuine and specific. With those points in mind, you can implement your own unique and creative employee recognition ideas, and start building a recognition-rich organizational culture. Culture leaders from some of the world's best places to work share some of their unique employee recognition practices. Anyone can start a round of applause. We believe celebrating those good examples will inspire others to do the same. Everyone wants recognition for their contributions to the company, but not everyone feels recognized in the same way. Start from the Beginning What is Employee Recognition?